Decisions, Decisions...what's a girl to do. I need to get busy dyeing fabric so I'm not behind come the first of the year when the quilt shows are all gearing up. Last week I made a delightful trip to United Notions/Moda and bought 5 bolts of PFD. 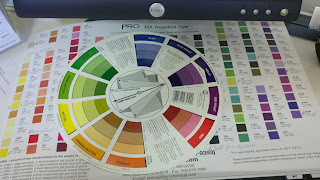 Today, I'm sitting here with my list of dye colors and my color wheel. Trying to decide what new color combos would be pretty and pleasing to the eyes of my customers. So, help me out here ya'll, what color combos do you like? When it comes to color, I'm all over the place, but recently, I've been using jewel tones and love, love, love peacock colors. Can't wait to see what you come up with.